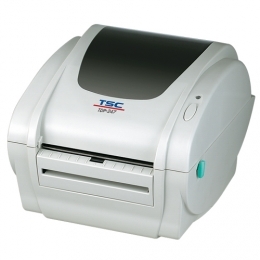 TDP-247 and TDP-345 direct thermal printers provide top-quality results at a high print speed - that is the trademark of the TSC desktop label printer series TDP-247. The series consists of two models, the TDP-247 and the TDP-345. The latter produces high resolution labels at 12 dots/mm 300 dpi, and the TDP-247 achieves at 8 dots/mm 203 dpi a print speed of 178 mm/sec. According to your requirements you will always be able to find the right printer to meet your needs. Its easy handling covers the spectrum of media loading, installation and integration. Thanks to its ergonomic clamshell design, simply drop the label roll into the storage bay it automatically recognizes the top of form. The TDP-247 Series comes standard with USB, parallel and serial ports, and as needed, you can integrate an optional internal network connection. Language support, such as EPL and ZPL is also integrated. Its 4 MB Flash memory and 8 MB SDRAM provide more than enough space for daily operation, however, via SD card you can expand the memory up to a maximum of 4 GB. The printers also optionally operate in stand-alone mode with a keyboard.